Walking into our Trader Joe's this past rainy weekend, "La Bamba" was playing on the store's radio. You all know the song. 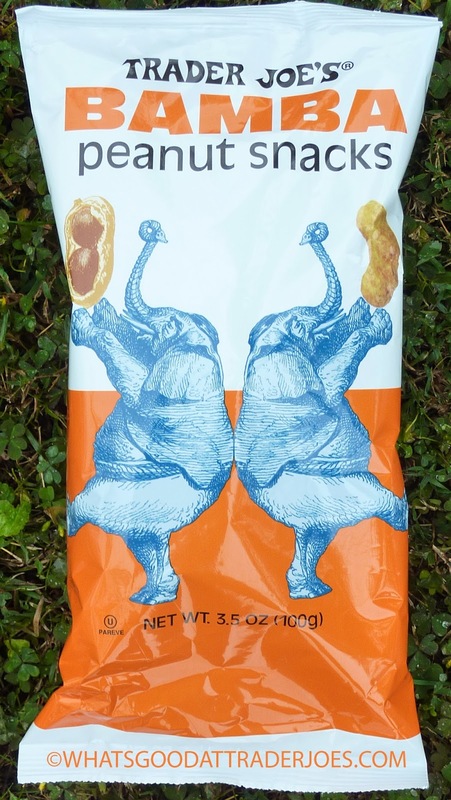 It has nothing to do with these Bamba Peanut Snacks, by the way, which hail from Israel rather than Mexico—but we still wonder: were you planting subliminal messages in our head with that song, Big Joe? You sneaky marketing genius, you. Well, your fiendish plan worked, and we picked up two 99 cent bags of the peanutty treats. 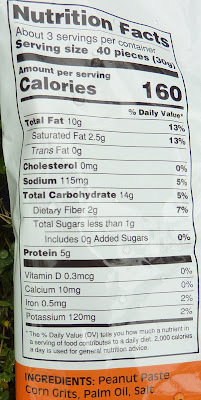 Not long ago, I ran across Simply Balanced Peanut Butter Baked Corn Puffs at Target and reviewed them. I liked them overall, and of course, the first comment about them mentioned their similarity to "Bambas." I looked them up, and sure enough, everything about the original Israeli snacks sounded extremely similar to Target's version. Didn't take Trader Joe's long to jump on that bandwagon. Well—okay, I guess it did—since these have been popular in the Holy Land for well over 50 years. 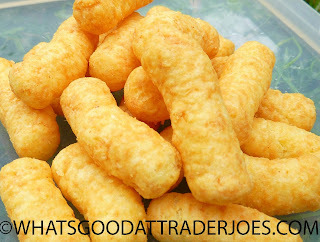 And I like that they're actually using the original "Bamba" moniker at TJ's, just so there's no ambiguity. I've seen a few tweets indicating that they might not be exactly the same as Israel's version, but I've also seen tweets indicating that they definitely are, and that TJ's supplier is indeed Osem, the same people that make the original, authentic peanut snacks. Please note: I'm not making any official claims here, I'm just reporting what I've read on the interwebs...and you know how that goes. They are in every way like cheesy poofs, except for the fact that...you guessed it: they have "peanut paste" instead of goofy orange cheese. So they are, for all intents and purposes, "peanut butter poofs." If that sounds good to you, you will LOVE these. Trader Joe's offering strikes me as being slightly less sweet, softer, and fresher than the Target version I tried. The peanut flavoring is still kind of subtle if you ask me, I mean, compared to, say, a spoonful of actual peanut butter—but it builds up on your tongue as you shovel puff after puff into your mouth. It's not a super heavy snack at all, but it's uber-satisfying. Just a bit salty, nice and crispy...why are these just arriving in the US now? C'mon, Israeli-Americans. You've been holding out on us all these years. Why'd it take you so long to share these things with us? The packaging here is not resealable like Simply Balanced's product, but you most likely won't need to worry about the bag sitting around long enough to get stale once it's open. The ingredients are simple, few, and easy to pronounce. I could see vending machines being stocked full of peanut snacks here in the US in just a few years if these catch on. I can't think of a single reason why they wouldn't. Four and a half stars from me. Four and a half from Sonia. Ha - I lived in Israel for two years and these things are everywhere. EVERY Israeli kid grew up on Bambas. Glad they’ve finally come stateside! They’re addictive dipped in chocolate sauce too, but that was too much for my Israeli friends. when i first began eating these i was like "whatever" but i continued snacking.. turns out they are excellent! So glad you guys decided to review these and that you like them too. I put a few comments about them under the butternut squash review in hopes that you would review these soon. It's true the first few you eat are sort of unremarkable. Then the peanut butter flavor builds and you start shoveling them in willy nilly. And the good thing is you don't feel too bad about eating them since they don't really have any sugar and they do have some fiber and protein. I wonder if you dip them in jelly if it would be like a peanut butter and jelly (or jam) sandwich? Aldis had a peanut butter puff like this, during a 'german' week several years ago. These are Beaver Nuggets from Buccee's gas stations! They're a HUGE chain here in Texas, and everyone knows about Beaver Nugs! Sonia and I are in Texas now and have had our first Buc-ee's experience. We like it overall, but Bambas are nothing like those sugar bomb Beaver Nuggets! I've had the same experience as others. The first one tasted just okay. Nothing special. Then, after eating another one, I couldn't stop! I love these things. I'm glad they have some nutritive value. Nope. Bamba don’t add sugar.